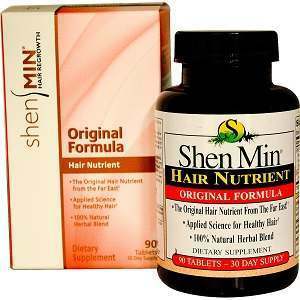 This is a review of Natrol’s Shen Min Hair Nutrient. The company’s product claims to aid in the growth of natural, healthy hair. They also suggest that this product can improve the speed of your hair growth, in addition to aiding new growth in areas suffering from thinning hair. Natrol also claims that their Shen Min Hair Nutrient can return elasticity to your hair, as well as reinvigorate hair follicles that have been damaged. Read on to find out more about this system & find out if it’s the right product for you. As stated on Natrol’s website, individuals are to take three pills with a meal, daily. Upon an extensive search of the company’s home page, we found that it is suggested that individuals wait between 90 and 120 days to see any noticeable effects from this treatment. Natrol’s Shen Min Hair Nutrient is an herbal supplement, so individuals under the age of 18 should consult a physician before consumption. It is recommended that any individual should consult with a physician before starting a new vitamin regimen. From the information Natrol provides, it seems that Shen Min Hair Nutrient does not contain any of the traditional compounds associated with hair growth, and instead sticks to its own proprietary blend. It should, however, be noted that we did find 2 scientific, peer-reviewed studies available online that suggested that these compounds (in particular, He Shou Wu extract) may aid in hair repair & hair growth. That being said, please keep in mind that scientific studies are tentative, and should not be taken as a guarantee. A single order of Natrol’s Shen Min Hair Nutrient costs $20.75 for a 1 month supply. Natrol does not sell this product through their website. Because of that, no discounts or subscription programs seem to be available for this product. Shipping quotes varied from site to site, averaging about $5.00 for anywhere in the continental United States. Because Natrol only acts as a wholesale distributor for their Shen Min Hair Nutrient, there is no guarantee available for consumers. Natrol’s Shen Min Hair Nutrient seems to be a dubious product for those individuals in need of a dependable hair growth solution. On the plus side, it is a relatively cheap product, especially for the amounts it’s sold in (90 capsules). Unfortunately, secondary seller sites had quite a large percentage of negative reviews, most of which claimed that the product was completely ineffective. And while Natrol’s Shen Min Hair Nutrient does contain a few interesting ingredients, none of those listed were the proven, traditional compounds we see in most of the hair recovery and hair improvement products available today. Because of these shortcomings, we hesitate to recommend this product over others. John Brownstone	reviewed Natrol Shen Min Hair Nutrient	on June 28th	 and gave it a rating of 2.5.